I trust you were looking for “trading for women” and happily, found this site! There are tons of material out there and while I do not claim to author new concepts, I offer to share what actually works and how being a WOMAN make the learning process easier and much more enjoyable. After all, Trading is simply, buying and selling. 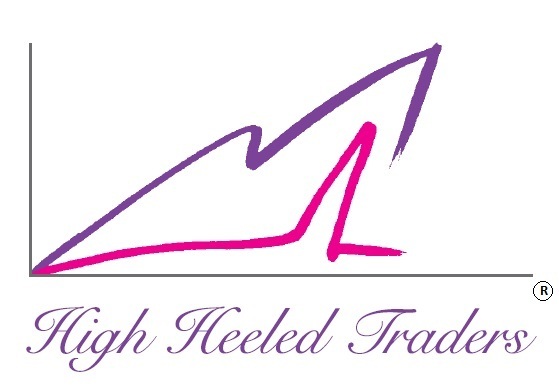 As I thought more about it, this trading business is much like SHOPPING for SHOES! (Now I’m sure I got your attention!) OK, I admit shopping is more on the buying part but a lot of Trading concepts apply. For instance, you like to buy what is in fashion. Buying blue? That is soooo last year! You would only go for what is in the new style. You’re in with the trend. In Trading, this is called “Trend Following“. And much that we are often accused of buying too many shoes : formal shoes, running shoes, many styles of sandals, boots, according to color, material etc., the important point is you shouldn’t blow out your budget and spend too much on one pair of shoes. Like so in Trading, you have to limit what you risk for any one position to be able to fund series of trades that will help you meet your goal. 2001 when I started to learn about investing, my goal was to create a life of love and abundance. Around that time I was also getting ready to be a mom, for sure, to be a mother is the hardest job in the universe. And for sure, the job with the most reward (however not of the financial sort hehehe) so I looked into investing as a business I can grow, on my own time, wherever I need to be (bring kids to school or at the park, or shopping), with a smartphone and the mighty internet it is so easy these days. But make no mistake — investing / trading is hard! Or should I say, making consistent income from trading is hard! Things just got easier for me after having studied books and teachings of Dr. Van Tharp (author of “Trade Your Way to Financial Freedom” and many others) and one of the key points is — “trade a system that’s right for you”. So I was minding my own business, checking my trades on my phone every now and then, when my lady friends started to get interested and want me to teach them. At this point in history we all know women are different from men, and looking out, there isn’t much offered for women. And so this blog is born, (which gave birth to the book) where I would like to share what works so beautifully, to trade profitably like only a woman can! 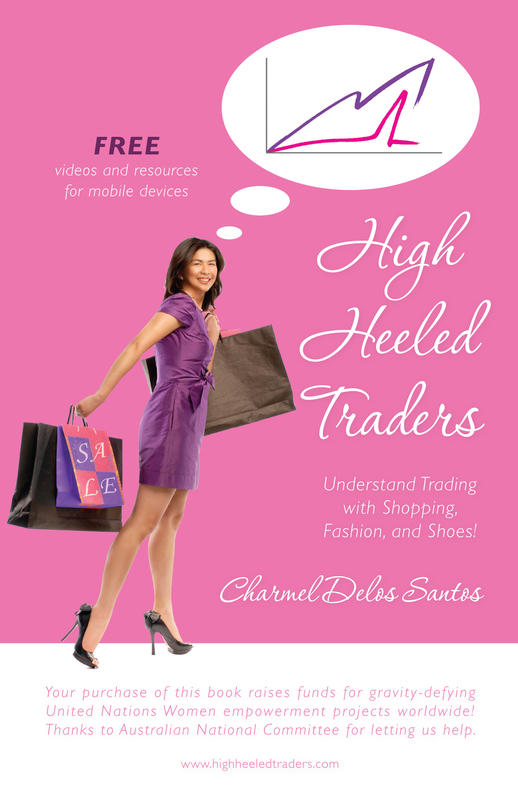 To receive the free 100-page Preview of the book “High Heeled Traders” email charmel[@] highheeledtraders.com. The book is available for sale here via Paypal (or use your credit card)! FREE shipping! Also at Amazon.com here and Amazon Europe you can also check out the contents with the ultra-cool Search Inside feature. Also available via online booksellers in the US, UK, Australia. High Heeled Traders - now on sale here! Thanks Rose for your messages, we sent the download details already. Enjoy! I already sent my payment for your ebook. Kindly check your email. I cover “position sizing” rather than money management which has a broader scope. Position sizing will let you maximize profit and control risk and actually guide you in how much you will be risking per trade. I answer YES to questions about systems devt and BA background helping me but that’s not going to take care of attaiining comprehensive knowledge of trading. Check out the free eBook so you’d get an idea what this business is about. As any business or profession, the more extensive and in-depth you study, the better the results. Hi, Charmel! I’ve heard about your book from a former officemate who’s into trading. I’m new to stock investing and would like to learn more. I hope I can also get a copy of your eBook. Many thanks and God bless! Hi Charmel! I sent you an email last week after I registered on your site. Hoping to receive a free copy of your e-book as you announced on ANC’s On The Money. 🙂 Excited to hear from you despite your busy schedule! Hi! Joy, I did receive it and thank you for trying so hard to reach me. I sent you back a reply and I’d be happy to help you invest successfully. Thanks ing.wap.sap for commeting and buying the book! Sorry for the late reply here but I believe the eBook has been sent to you also. I hope you had learned and enjoyed reading the book. I’d be delighted to hear your feedback on it and if you have any questions, just email or put here! Hi! dl, Sorry for the late reply here in the Comments section but I believe the free eBook has been sent to you. I’m just amazed that you found me! Am I right guessing that you are in Hungary? I used the .hu in your domain name as a clue. All the best and I hope you learned and enjoyed the eBook! Thanks Market Stalker for commenting and your very sharp questions! I did say in the Welcome message above that “Trading is hard or making consistent income is hard and it got easier for me with effective training”, and of course commitment. It is easy once you know what you are doing (like every other job / profession in the planet!) I get many comments from readers and those I mentor individually of the kind of enlightenment they get from my book / blogs. You ask how successful they become? I can not answer that – because they have to do their part. There are things that only the person / investor can do for him/herself like being disciplined and adopting the mindset for success in investing / trading. A book / blog is just a starter in the road to mastery of this business. This medium is limited that’s why I am doing workshop so bring in ‘aha’ moments for the investor. This is transformational stuff ! I look forward to seeing you at our workshops. I wish you all the very best! Congratulations on your blog, your best-selling book and your upcoming seminar. I have recently started a blog to voice my ideas and opinions in the market. Like you I am a private trader who has the scars and wounds and hopefully the experience to share so others might learn. I started to read your blogs and have thought about signing up for your January seminar. Before then, can I ask you a few questions? Is trading really that easy? You are suggesting numerous tips on how to be a successful trader but do have any idea how many of those who have followed your advice are really successful and how many that are not? hi ma’am. i just registered. am so excited to get your free ebook. thanks! Hi! Paolo, I invest in Oil stocks, not in oil itself (as sold in the commodity markets) bec that requires delivery and storage – usually big money like investment banks would transact in that market. Anyway, for me I got invested in oil stocks as ypi’ve mentioned everyone needs it. You are in Singapore so you can look for oil stocks being traded there that you can invest on. In PSE there are not a lot of oil companies there that is tradeable. You can try investing in countries like Australia / US if you want to invest in oil stocks. Be sure though to trade it with correct strategy and develop mastery of the subject ie. factors affecting its price moment because of the volatile nature of oil. In my book I use the example of trading an oil stock in explaining the detailed trading procedure (in effect it shows how to trade an oil stock). All the best! Hi Charmel, I saw you on ANC on the money via youtube even though I am not a women, I am interested to have copy of the book. I am from singapore working on the field of OIL and Gas. I am starting to build my capital for my investment and when you mentioned on ANC that you are investing on oil i really get interested I always knew that oil is the prime commodity around the world and everyone needs it. I wanted to know how you do it. Thank you for sharing your expertise. very good idea and appealing cover. Let me request the free proview of the book. Hi, I saw you on ANC about 2 weeks ago and I want to know the basics of trading, could you please give me the preview of the ebook? thanks. Hi, watched your piece on ANC and the first thing I did the next day was to buy your book at fully booked, ha ha. Already on page 27, hopefully would be able to finish it by the weekend. Cheers and more power! Or if you can speak German – here’s the page! Hi! Tabugie, glad you were able to catch my guesting in ANC, we saw you’ve registered at the site and the free preview ebook has been sent. Cheers! Hi! Lee, it’s not automatic, haven’t had time to automate it. Will send it shortly. will the ebook be automatically emailed after i register? Hi! Claire, saw that you registered in my site,the eBook has been emailed to you. Cheers! hi mam,i saw your guesting at ANC. I would like to know how to have your e-book? Hi!, I saw you at ANC’s “On the Money” and got interested with your book right away, is this available in Phil. bookstores? If not, how can I order if I don’t have a paypal or credit card? I just ordered a copy of your book, thru your site shopping cart. 🙂 I’m so excited to receive it. Very informative blog, too! Thank you Mommy Dharlz, I’ve emailed you or you may click on the Products section on the lower right hand side. All the best! I wanna have a copy of your book.. Thank God I found ur site, Im hoping to go to ur book signing:) I hope you can have internet forum too:) Godbless you more. you are amazing charmel! I will come back on this site again later… it looks interesting to me, and so i think for most women. good job! Now I am ready to trade.. this blog has a wealth of real information about trading. I am back and ready to trade your post today on “What to trade” (a moms guide) was oh so what I needed (as always) thanks again! Gemma Blancaflor Marbel golly where u get all those fantastic and realistic ideas … love all atsaka yong trade mo na system mo ok. Cha .where u get all the time to write those sure busy ka din with your babies… malayo na ang nabaybay ko hindi ko na rin matandaan but dont worry i will send u a personal messages .. untill then thank you again for feeding me with your knowledge hija. I’ve read a few of the posts on your website now, and I enjoy your style of blogging. I added it to my favorites blog list and will be checking back in the near future. Please check out my web page too and let me know what you believe. I’m impressed, I need to say. Really rarely do I encounter a blog that’s each educative and entertaining, and let me tell you, you’ve got hit the nail on the head. Your idea is excellent; the problem is something that not sufficient people are speaking intelligently about. I’m very joyful that I stumbled throughout this in my search for one thing referring to this. After research a few of the blog posts in your web site now, and I really like your way of blogging. I bookmarked it to my bookmark web site record and can be checking back soon. Pls try my website as effectively and let me know what you think. I seriously liked your Blog page. Pretty wonderful enteries submitted in this article. Keep on providing handy material. I undoubtedly desire to come to this kind of web site in the future. Great post! I’m amazed at how quick your blog loaded on my mobile. I’m not even using WIFI, just 3G. Anyhow, superb site! Sweet website , super style and design , really clean and apply friendly . this is a really riveting post, as a consequence of you for the benefit of the information. Sorry my english is not the very best. do you remember if it is practicable to turn this to the spanish language. that would be sheer helpfull. I recently noticed this site weeks ago since a family member mentioned it to me. I have been a daily visitor since then. Thank you! I am glad the info here is helpful to you. Let me know if there is any question you have in mind that I could share something relevant to. cheers! Hey! I love holidays, so I have to wish you calm and Merry Christmas. I hope that new year will be more succesful for everybody. Can I tell you a few words? I have read this post and if I might I would like to propse you few intresting things or advice. Maybe you can publish more posts reffering to this post. I want to read next information about it! I am sure that I come again and read the newest of your texts. Thank you and I also appreciate you leaving a comment for me about the info I shared and what you thought of it. Would you like to know anything about it further so I can write relevant stuff?! cheers! Happy New Year! Thank you for your comment. I hope you can tell me later what other aspects you would like to know on the subject so I can write as relevant as possible. cheers! Happy New Year! Wishing you a merry Christmas and a fantastic holiday season, and here’s to a prosperous New Year too! Sometimes I will even keep a few specific blog posts open in my browser for days – this post is one of them. I appreciate you taking the time and effort to share your thoughts with us. thanks! my favorite thing about Trading is that it works in Up, Down and Sideways market. Not a lot of investments / business will let you profit like that. cheers! Trading is definitely the way to go!! Good for you! Wow! Blown away that you found this site already! Thank you. I’ve just “pre-launched” it to friends to get feedback. Please come back often and share to others — promise I’m posting more to get the Right Start, how to find winning trades and more importantly how you can trade with low risk and high reward. Sounds cool? I haven’t officially launched but you already found this site! Thank you…may I ask a favor to let other people know about it? I am posting more articles about how to start getting an income from it… just in time for “New Year’s Resolution” hahaha THANK YOU.